When Chiang Kai Shek (蔣介石) and his Chinese Nationalist Party retreated to Taiwan in the latter part of the 1940s, they brought with them over two million people including soldiers from the ROC armed forces and with them their families. Due to the delusional nature of the political situation at the time, they came up with a plan to set up ‘temporary’ housing for members of the armed forces and their families until such time that the Nationalists could retake the mainland from the Communists. To serve this purpose, “Military Dependents’ villages” (眷村) were set up around Taiwan offering shoddy quickly assembled housing to those families. Unfortunately, those 'temporary' homes became 'permanent' as Chiang Kai Shek’s dream of going home was never going to come to fruition. This guy has a pretty cool imagination. When the villages were built, they were they were very poorly constructed and extremely small. There was no possibility for the residents to hold ownership rights over their homes as they were property of the state, which eventually led to problems decades later. Over the years many of these buildings have become abandoned, have fallen apart and have become somewhat of a slum for an aging population. These villages also occupy prime real-estate space within cities where development is often more important than the welfare of citizens. The government began an aggressive program of demolishing the villages in the early 1990s and started to replace the decaying villages with new high rise apartment buildings which had space allocated for the displaced families who lost their homes. If you pay attention to the news in Taiwan, you can often see stories of residents of some of the remaining villages protesting the destruction of their homes - especially in Taipei where very few remain. City and county governments all over the island are trying their best to have them demolished but obviously have to contend with civic groups and people who are unwilling to move creating an often tense atmosphere that plays out well in Taiwan's dramatic media environment. A family taking some selfies at the Rainbow Village. Taiwanese people are well versed in exercising their rights and taking to the streets to voice their displeasure with government action (or inaction) often leading to mass protests and government shut downs. One of the most interesting and creative forms of protest in recent history however came from an 87 year old man who was in a battle to resist having his home torn down. 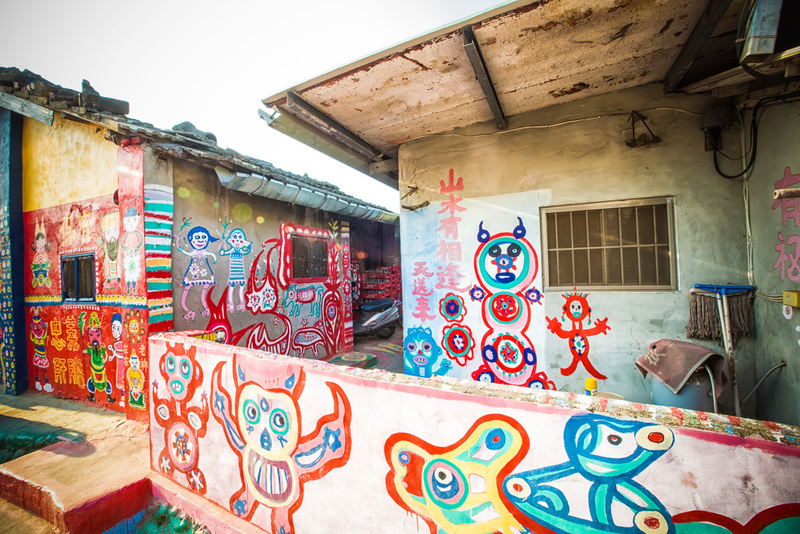 The story of Taichung's “Rainbow Village” (彩虹眷村) and its famous creator Mr. Huang Yong-Fu (黃永阜) has become quite well known throughout the country and is a fitting example of how a protest done right can be really effective. Mr. Huang is a military veteran who was born in Hong Kong and fought against the communists in the ROC army. After living in Taiwan for more than 60 years, the city government in Taichung decided it was time for the village he lived in to be torn down. Mr. Huang who people now refer to as the “Rainbow Grandfather” (彩虹爺爺) came up with a way to protest that was quite unique and also gave him something to do to pass his time. Rather than fighting the government - he started to paint. As a self-taught artist, he painted colourful murals all over his home, as well as the gates around it and the walkways. He used very bright colours and painted very random and imaginative figures including plants, animals, monsters, celebrities and traditional cultural heroes. 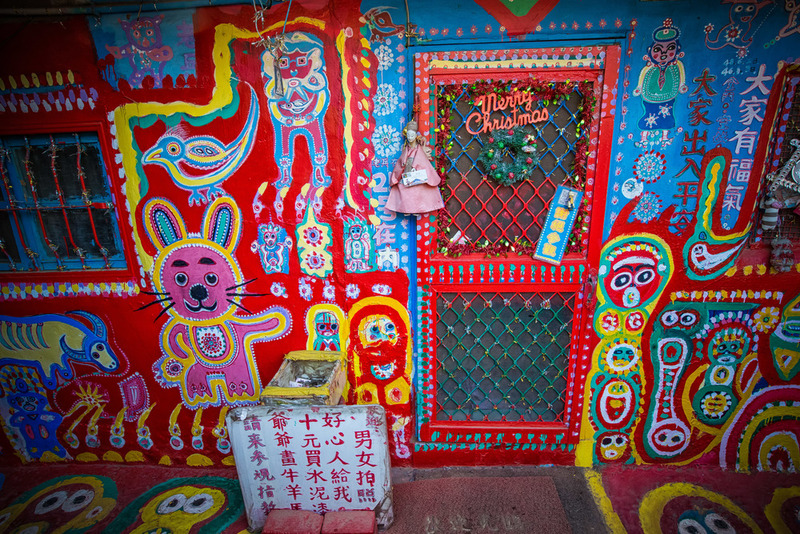 The “Rainbow Village” soon became a tourist destination as people from all over started to visit while he was still busy painting. The tourists offered donations and supported the by-then almost 90 year old artist. His peaceful protest fortunately gained enough sympathy from around the country that the email inbox of the mayor of Taichung quickly became so full of complaints that plans to demolish his village were quickly shelved. Bottles of Coke that Mr. Huang sells to people who visit. 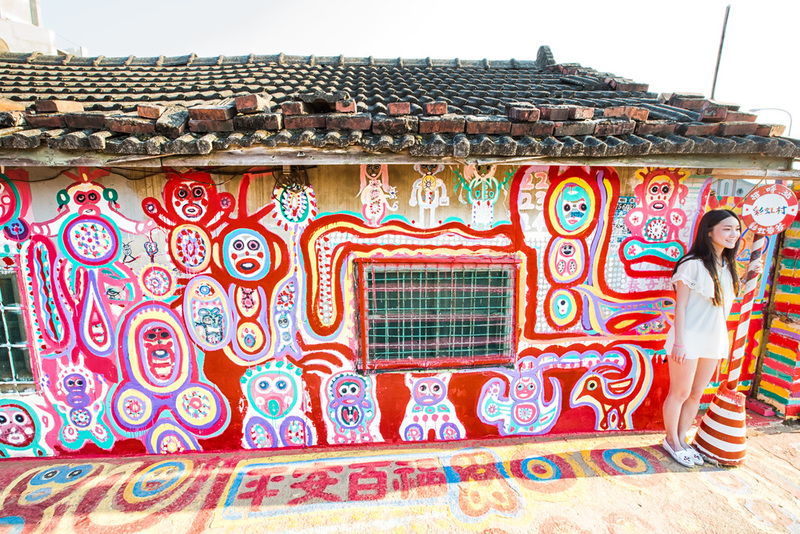 The Rainbow Village is still around today due to the effort and creativity of Mr. Huang. 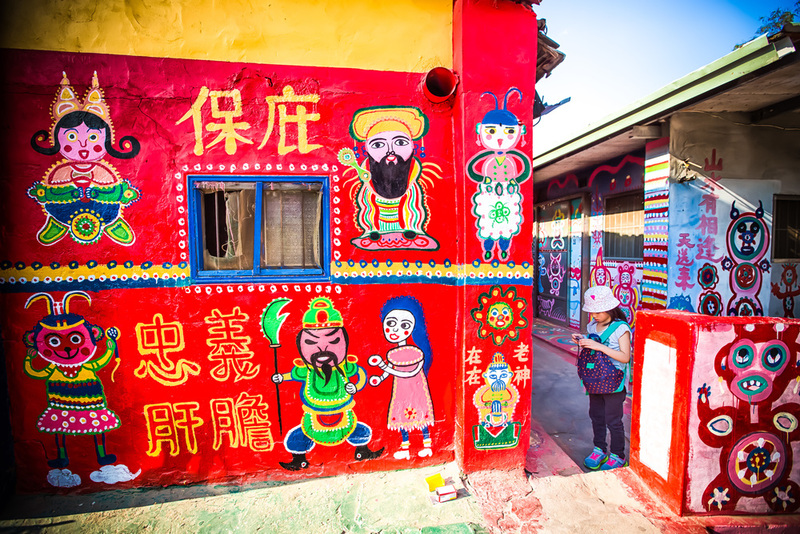 If you are in Taichung, the village is well worth a visit - If you do visit though, remember that the Rainbow Village is actually the home of a retired 90 year old man and his family. If you like what you see, don’t be shy to drop a small donation in his donation bucket or at least buy a soda or a hand-made souvenir. The life of a retired soldier isn’t one of great wealth, so think of your visit like that of going to a museum. Mr. Huang invites everyone to enjoy his home and his art and doesn’t ask anything from you, but if you appreciate what he’s done - help a guy out and he'll be happy to take a picture with you!